Public sector staff are more likely to feel anxious at work and take sick days for their mental health than those in the private sector, research suggests. The charity Mind asked 12,000 UK employees about their mental health. It found 48% in the public sector took time off for their well-being, compared with 32% in the private sector. Paul Farmer, Mind's chief executive, called on organisations to combat a "culture of fear and silence in the workplace" towards mental issues. He said the next government should make mental health in the workplace a "key priority". Mind found 15% of public sector workers - of which there are 5.4 million in the UK - said their mental health was poor, compared with 9% in private sector. Among public sector workers, 53% said they have felt anxious at work on several occasions over the last month, compared with 43% of their private sector counterparts. But the research suggested public sector workers were more likely to speak up if they were suffering mental health problems. Of those with a mental health problem, 90% of public sector staff disclosed it to their employer, compared with 80% in the private sector. 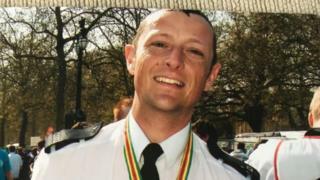 Alan Phillips, a former Essex Police officer, suffered flashbacks of old incidents when he was at work - but lacked the confidence to confide in his colleagues. "I joined Essex Police in 1986 and after many experiences, my mental health started to decline in 2013," he said. "I was working very hard and at an intense level. Every now and again I would get flashbacks to certain incidents. "I would feel sick as the memories flooded back. Other times, I'd feel overwhelming despair, that life was just not worth it - but I'd tell people I was OK."
He said his behaviour at work became erratic and on several occasions he was spoken to by supervisors, but felt like he could not tell them how he felt. Mr Phillips, 50, was later diagnosed with depression and post-traumatic stress disorder (PTSD). Now retired, he said he finally began to feel better after he confided in his wife and sought help from a doctor. "I feared people would judge me and no longer talk to me," he said. "The reverse is true and I have been treated positively and realise I am not weak at all." According to the Mental Health Foundation, 70 million working days are lost each year to poor mental health. The public sector workers surveyed said they had taken an average of three sick days in the past year for a mental health issue, compared with an average of one sick day for those in the private sector. However, only 49% said they felt supported after disclosing mental health issues, compared with 61% in the private sector. Mind's chief executive said the public sector was "making progress" as more people tend to open up about what they are experiencing. "But it's also vital that when people do speak out they get the right help and support at the right time," Mr Farmer added. "It's clear there is still a long way to go in both the public and private sector to address the gap between people asking for support and actually getting what they need." Currently, police, fire, ambulance and search-and-rescue teams in England and Wales get government-funded mental health support. Through a £1.5m grant, Mind provides emergency staff and volunteers with access to help under a project known as Blue Light, which is now being extended to Wales. It encourages staff to open up about their well-being and to feel like they can seek support if they need it.